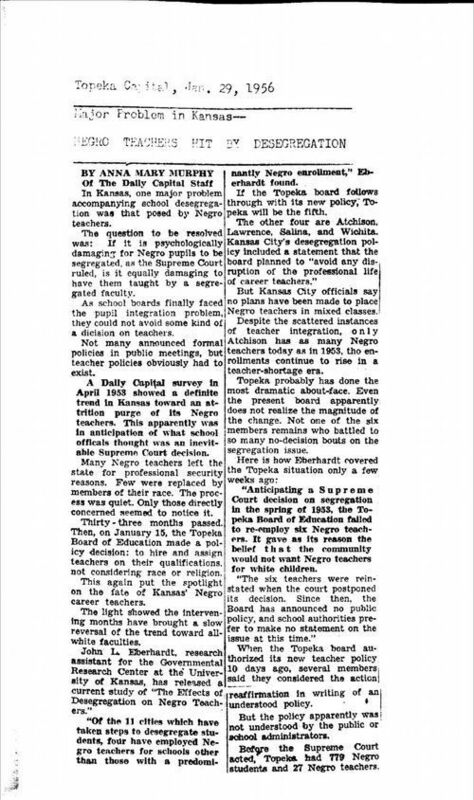 This article describes how the desegregation of schools in the wake of the Brown v. Board of Education case would affect black schoolteachers across Kansas. The author gives the example of Topeka where, when the school board began desegregating schools prior to the final decision in the Brown case, black teachers lost their jobs. Although the school board wanted to "avoid any disruption of the professional life of career teachers," many schools were hesitant to place black teachers in classrooms containing both white and black students. Members of the black community who had opposed the Brown v. Board case at the local level had feared that integration would apply only to students, not to teachers, and it appeared to some that this would in fact be the case. This source could be grouped with other newspaper articles that discuss the process of integration to encourage discussion about the challenges of desegregation. Students could use this group of sources to formulate plans for integration that would potentially solve some of these problems.